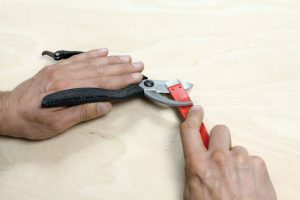 If possible, pruning and hedge shears should be disassembled before sharpening. Only the bevels (facets) are worked on both blades (upper and lower). 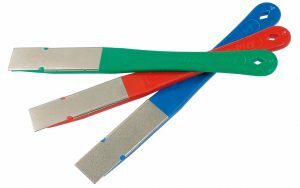 Use the coarse (blue) DMT mini-hone for rough corrections or to remove nicks from the blade. Use the fine (red) mini-hone for finishing. DMT Dia Sharp Mini Hone Set (No. 706282). 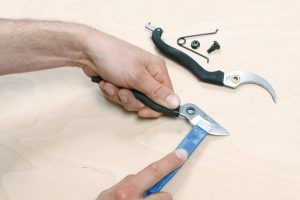 Pruning shears can get quite dirty because they tend to be used outside and get contaminated with plant juices. To ensure that the shears operate smoothly and to remove the dirt, use Ballistol spray (No. 705445). Spray some oil into the joint and onto the blade and polish the blade with a dry cloth.